Support a Tiny Home Village in Denver Today! Support our crowdfunding campaign for Little Denver TODAY! Little Denver is a project being built by, with, and for people currently without housing in Denver, CO. We seek to create affordable, sustainable alternatives to the current housing system. Tiny homes, residential structures between 100 and 200 square feet in size, is what we propose. We seek to build these homes and place them wherever makes sense. Our vision is to create a community of micro-houses grouped grouped together in a Tiny Home Village. We are in a housing crisis. Denver rent is at a record high and keeps getting higher. Continued cutbacks for affordable housing funding and maintenance, combined with the rising cost of housing in Denver, has made housing more scarce and competitive than ever. Today in the Denver Metro Area there are at least 6130* individuals without housing; the largest reason cited for this is an inability to pay the rent or mortgage in the current market. We have to exist somewhere, and because there are little suitable options to access affordable housing if you work a low-wage job, or are unable to work, we have to create options for ourselves and defend our right to exist in public space. A Tiny Home Village is a cheap, ecologically conscious, communal, tangible and dignified alternative to being criminalized for surviving in public spaces, or trying to hustle a spot in the overcrowded shelter system. What we need now is a small fund to build several homes. We are asking for $8000, which will be used to construct two types of micro-housing: Conestoga Huts, an insulated dome-like structure that prices at about $700, and Tiny Homes, traditional four-walled wooden homes which cost about $2500. 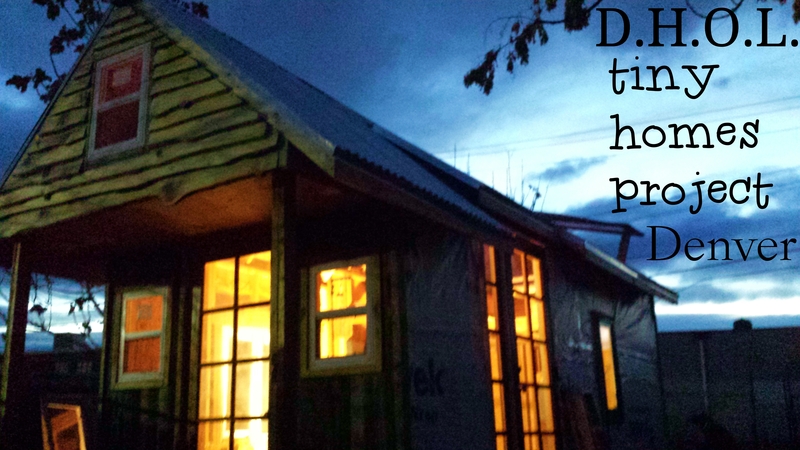 If we get to $10,000, we will be able to build another Tiny Home or two more Conestoga Huts. 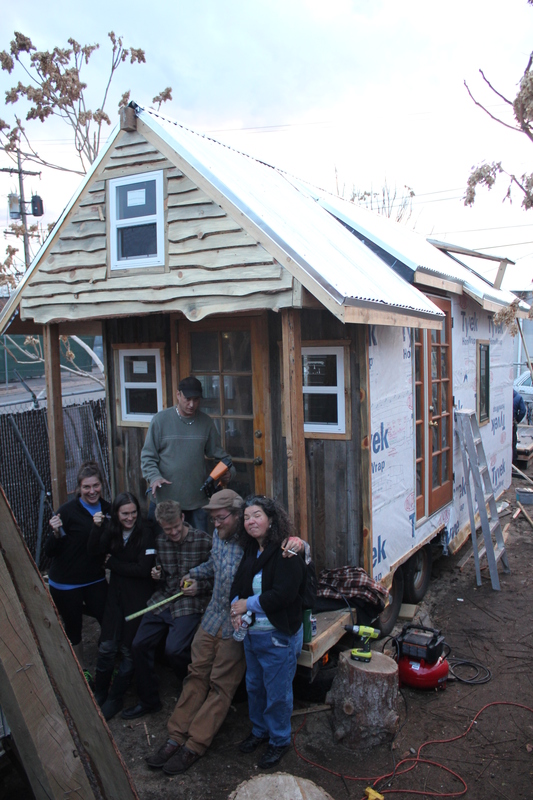 If we can even get to $12,000, we can build up to four Tiny Homes! These will be used to provide life-saving shelter for someone through the winter. The question we get most often is “where will you put them”? Due to the prohibitive cost of land in Denver, the tiny homes group has been so far unable to access a good sized area for the village. However, to move forward into the winter of 2015, at a time when so many are seeking shelter, we have decided to start building houses and finding spaces for them wherever we can, while simultaneously pursuing avenues of accessing larger, publicly owned plots of land. We hope this endeavor can provide a clear model for what they look like and pave the way forward to accessing land. We will be launching the campaign on Wednesday, October 7th! It is being launched through Community Funded, a locally-owned, locally controlled platform that takes zero fees from the money we raise. –Can you contribute to sponsor a House for someone in need? –Can you share the campaign with your networks? Please let us know. We appreciate and are so grateful for your support. ← COPS CAN’T TICKET YOU FOR PANHANDLING! Hi there,I check your new stuff named “Support a Tiny Home Village in Denver Today! | Denver Homeless Out Loud” like every week.Your writing style is witty, keep it up! And you can look our website about fast proxy list.